The big sports news over the weekend came out of the golf world, where Tiger Woods won the 2019 Masters for the first time in 14 years to complete what many are calling one of the greatest comeback stories in sports history. Financial market observers were quick to point out that a win for Tiger, equals a win for Nike (NYSE:NKE). The logic is simple. Tiger Woods is a Nike athlete, and his return to the mountain top should lead to a surge in golf-related Nike sales, which should lead to boost in Nike stock. Indeed, some Nike golf apparel had already sold out by Sunday evening on Nike’s website. But, even as a long term NKE bull, I think those headlines are misleading. In the big picture, golf is a very, very small piece of the pie for Nike, and that small piece is only shrinking. Thus, while a Tiger Woods victory should lead to a healthy bump in golf-related sales for Nike, that bump will hardly be seen in the overall numbers, and it won’t move the needle for Nike stock. Because of this, I think the Street is looking at the wrong catalyst here. Nike stock will head higher over the next twelve months, but not because Tiger Woods won the Masters. Rather, because Nike is launching a new signature basketball shoe for NBA superstar Giannis Antetokounmpo within the next few weeks. Unlike golf, basketball is a huge piece of the Nike pie, and its share is only growing. Because of this, prior signature basketball shoe launches over the past five years have catalyzed big growth in both the numbers and the stock. This one should do the same. I mean no disrespect to the sport of golf; it’s a great sport with a ton of fans and wide reach. But, when it comes to Nike’s revenues, it is largely meaningless next to basketball. In 2017, the last year that Nike separately broke out golf revenues, golf’s wholesale equivalent revenues measured under $600 million. The basketball business, which includes Jordan brand, measured nearly $4.4 billion. 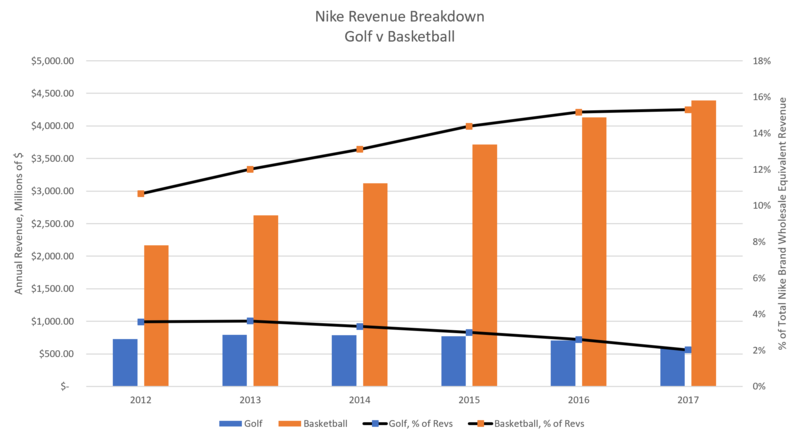 As a percent of total Nike brand wholesale equivalent revenues, golf represented just 2% of the pie (down from 4% in 2012), while basketball represented 15% of the pie (up from 11% in 2012). 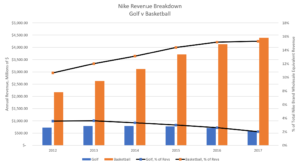 Thus, over the past five-plus years, golf has consistently been an exceptionally small business for Nike, and its presence has only been getting smaller and smaller as golf’s popularity has dwindled. Golf viewership has been in a secular decline for several years, and the sport is failing to appeal to younger audiences. Meanwhile, basketball has been an exceptionally big business for Nike, and its presence has only grown as basketball’s popularity has soared (NBA viewership has been on the rise for several years, and the sport attracts a young demographic). Because of this, when looking for the next big catalyst in NKE, it is smart to look in the basketball market, not the golf market. When you do that, you’ll see that there’s reason to be excited about the potential upside in Nike over the next several months. The next big catalyst for Nike is the company’s first signature basketball shoe launch since 2017, and that’s a big deal, since signature basketball shoe launches tend to spark big rallies in NKE stock. Nike has had two big signature basketball shoe launches over the past five years: Kyrie Irving’s signature shoe launch in December 2014, and Paul George’s signature shoe launch in February 2017. Both were big catalysts for the numbers and the stock. Following the Kyrie 1 launch, basketball revenues rose 21% in fiscal 2015, and Nike rallied from $48 in December 2014, to $66 by December 2015. Meanwhile, following the PG 1 launch, basketball revenues rose 16% in fiscal 2018, and Nike rallied from $50 in February 2017, to $70 by February 2018. In other words, prior signature basketball shoe launches from Nike resulted in a huge boost in basketball sales, and because basketball comprises such a big chunk of the Nike revenue pie, those big boosts ultimately led to huge rallies in Nike stock over the subsequent twelve months. The same thing should happen this time around. Giannis Antetokounmpo is arguably the NBA’s best player today, with a unique story (he hails from Greece and plays for a small market team) and ton of likability (his jersey is one of the top selling jerseys in the NBA). In other words, he has all the makings of someone who will sell a ton of shoes over the next twelve months. Thus, once his signature shoe The Freak 1 launches within the next few weeks, that should kick-start what will ultimately turn into a big twelve month rally for NKE stock. Everyone is talking about how a win for Tiger Woods equals a win for Nike. That’s not really true. It equals to a win for Nike’s golf business, but because that golf business is so small, it’s honestly much ado about nothing for Nike stock. Instead, the big catalyst here is the launch of a new signature basketball shoe from Giannis Antetokounmpo within the next few weeks. Basketball is a big business for Nike, signature shoe launches historically lead to a big boost in that big business, and that big boost historically sparks a big rally in Nike stock. The same pattern should play out this time, implying healthy upside for Nike stock over the next several months thanks to a new signature basketball shoe. Article printed from InvestorPlace Media, https://investorplace.com/2019/04/nike-stock-golf-bump-basketball-bump/.